We stand behind the quality of our books, because each is made by us right here in our shop and studio on Marrowstone Island, Washington, USA. We don’t outsource any of our work and we only hand sign a book and ship it to you if we’re happy with its quality and finish. 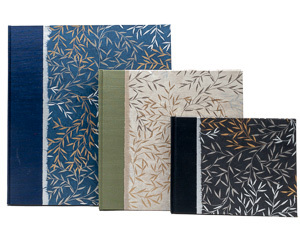 We make every book to order, one at a time, so each book is unique. Since we make it from scratch, and don't use pre-made components, we can customize and personalize your book to make it as unique and special as you like. Our Albums have pages of a heavy (80# Cover or 220 gsm) paper stock, that is an off-white color with a luxurious felted surface. 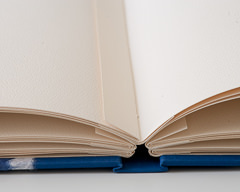 The paper is acid free, and we do not use any plastics in our books that could yellow or degrade. We sew tabs between the pages to accommodate for the thickness of the photos. This keeps the books from bulging when they are filled with pictures. We sew the pages by hand, using needle and Irish Linen thread, so the pages lay flat when the book is opened. 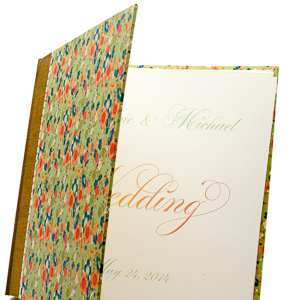 Consider adding a name or date to a Wedding Photo Album! We can personalize the title page of any book by printing a name, date, quotation and even a picture. We custom design the colors, text styles, and layout to your specification and send you proofs in PDF form for review, correction and approval. If you would like a personalized title page, please select a font, color and enter your text (along with any special instructions) in the product page. 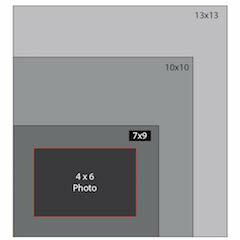 If you'd like us to print a picture, let us know, and we will follow up with you in email. 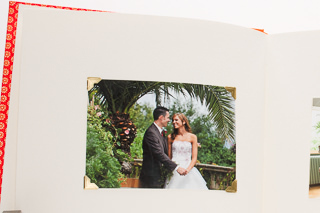 Photos and scrapbook items are mounted in our albums the traditional way, using photo corners, glue stick or double sided sticky tape. Click here for more information on mounting photos in our albums.